Every Social in town has its own appeal, and that stands true with this one too. 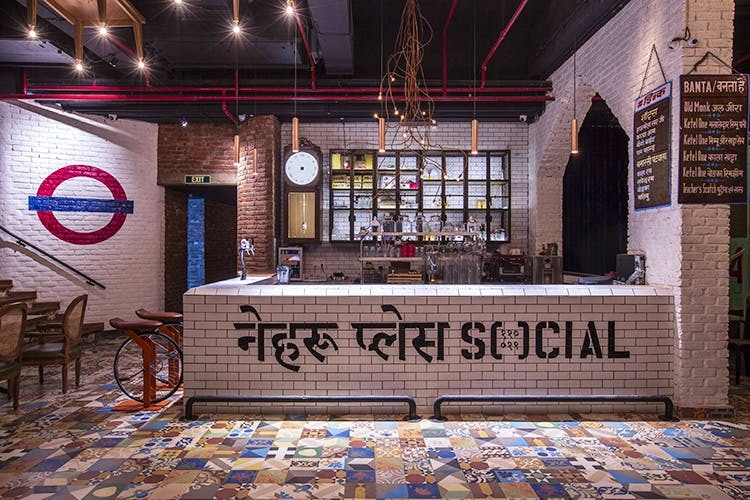 Contemporary quirk with an urban-desi touch and a mix of interesting foods and drink, Epicuria Social should be your next go-to spot. One of the first things you notice is the hashtag pirated, when you enter; the setting is spacious and well divided between indoor and outdoor seating. The outdoor area has a row of old concrete benches that ‘are in loving memory of’ pop culture elements like the walkman and MS DOS (you also get a view of the busy Nehru Place market and the high-rises next to it). The indoor area on the other hand, has its own vibe; with ferris wheel-style enclosures, stadium-like stair seats, a generous area for dance and a co-working space. Hanging chairs and tables illuminate the area and the DJ has a classic Delhi ‘band waalah’ banner in front of him—you can also spot a metro sign and lots of pop culture references scattered across the space. Almost everyone is aware of the classic Social menu, but this one brings more to the table (literally). Few new additions to the menu are, the Butter Salt & Peperoncino Wings, the Killer Kebab Platter, and the Bhoona Sausage Pao. While each new addition is equally delicious, it is the Killer Kebab Platter that nails it with its spicy kebabs and bao mix, and wins a recommendation (thank us later). Among the many cocktails that you can pick from the expansive drinks menu, The Lantern (a combination of Jim Beam, orange marmalade and sweet and sour served in a lantern) and the Banarasi Patiala (a potent sugarcane juice blend with options of dark rum, vodka, white rum or Malibu) are a sweet high guaranteed. There's not enough outdoor seating, and the place is super-crowded more often than not. Oh, also, if you're a group of stags, you might not have any luck getting in. Hey, if you don't have the Social LIIT, why are you even there? Also, do not forget to try the Butter Chicken Biryani.